Jesmyn Ward is an American novelist, a former Stegner fellow at Stanford and Grisham Writer-in-Residence at the University of Mississippi. Her novels, Where the Line Bleeds and Salvage the Bones, are both set on the Mississippi coast where she grew up. Bloomsbury will publish her memoir about an epidemic of deaths of young black men in her community. University MFA graduate Jesmyn Ward knows how to write about natural disasters because she lived through one. Many of the events described in her second novel, “Salvage the Bones,” were colored by her own experiences during Katrina’s ravages in August 2005. Ward was recognized last month when the book was nominated for a National Book Award — one of the most prestigious awards in literature (Jonathan Franzen, Cormac McCarthy and Eudora Welty count themselves among the select coterie). Winners will be announced at an awards ceremony tomorrow. Ward currently serves as an assistant professor of creative writing at the University of South Alabama and is already working on a third book — a memoir. Though she has enjoyed a considerable amount of success as a writer — her thesis for the MFA program turned into her first novel, “Where the Line Bleeds,” and she was chosen by Essence magazine as a Book Club Selection — she is not immune to the hardships of the profession. Not to mention that the experience of Hurricane Katrina was so emotionally draining, Ward wasn’t able to get started on “Salvage the Bones” for several years. Ward narrated that summer of Katrina: She had been staying with her family, enjoying a well-earned vacation in her hometown of DeIsle, Miss. following her graduation from the University — when the house began to flood. “We had to leave out of the house in the middle of the storm because we didn’t want to crawl up to the attic and drown, which was a possibility because the water was rising so quickly,” she said. 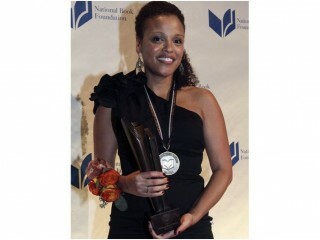 The National Book Foundation announced the winners of the 2011 National Book Awards on Wednesday evening, bestowing the fiction award on Jesmyn Ward, author of “Salvage the Bones,” which chronicles 12 days in the life of a poor African American family attempting to weather Hurricane Katrina in coastal Mississippi. View the full website biography of Jesmyn Ward.